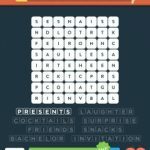 Stuck in Wordbrain 2 Party (Word Navigator 8×8). Here are the answers. Sorry, previous comment was wrong theme.